Paddock care and grass land management form an essential part of horse and livestock ownership. Unfortunately many owners do not have either the equipment, experience or time to carry out this work when necessary. A well kept horse paddock or field can provide an economical source of quality food for a grazing animal during the growing season. Horses are selective grazers and some areas of paddocks can become sour, poached or overgrown with weeds. Poached, thin or poorly maintained grass will soon turn to mud during the winter months making it more difficult to restore the areas for Spring grazing. 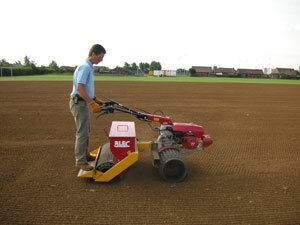 During the past 18 years we have built up a comprehensive range of landscaping equipment. Many of these machines and implements are well suited to grass land maintenance, seasonal renovation or intensive restoration. 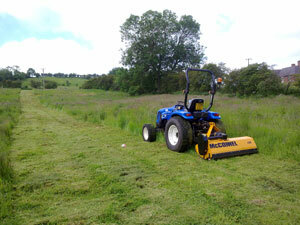 We have tractors on turf tyres for topping and flail mowing to keep weeds and long grass under control. Chain harrows and fertiliser spreaders for seasonal maintenance including Overseeding & Fertiliser applications to rejuvenate thin or worn out grazing after hard winter frosts, water logging and snow cover. Verti-drain machines are available for hire with tractor and operator. 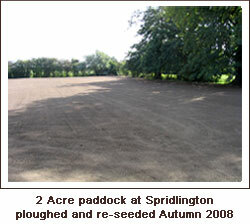 Compacted land will be slow to drain, often with poor grass cover , bare areas, weeds and standing water. 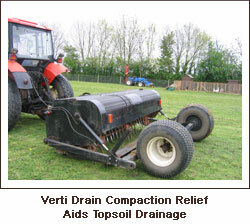 Verti-drain decompaction aids topsoil drainage and water absorption, aerates the roots encouraging grass growth and establishment. Racecourses, gallops, polo fields and other natural equestrian sports surfaces are regularly verti-drained to ensure peak performance . Quad bike or knapsack sprayer offer a chemical weed control alternative. A site visit is usually the best way to establish the best course of action to suit your circumstances and your budget. Phone or e-mail us to discuss you requirements. Just phone or e-mail us to discuss your requirements, and let us handle everything else. 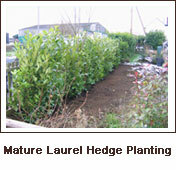 We offer hedge and tree planting to complement our other services and as part of our established landscaping business. 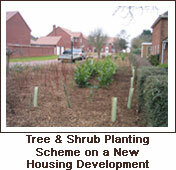 Over the years we have sourced and planted many schemes on housing developments, golf courses, and commercial development sites. 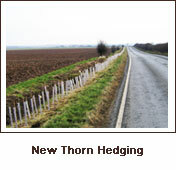 A planted boundary or area of woodland provides a wild life habitat as well as a practical function and can serve to reinforce a ditch or fence line. We can source and plant many native species including the favourites such as hawthorn, blackthorn, guelder rose, field maple, crab apple, oak etc. Bare rooted, root balled or container grown stocks are available along with all the planting sundries. Spiral guards, tree tubes, cones, planting compost, fertiliser, ties & stakes are all available to suit a specific planting item and scheme.